Disclaimer: BRAVO is not a pharmaceutical, medical or therapeutical product. BRAVO is a complex mixture of microorganisms and other ingredients available on the international nutritional markets without medical prescription. We do not offer nor give any medical or nutritional consultancy services. Refer to your doctor, dietician or nutritionist should you need advice in this fields. Unless otherwise agreed in writing by SILVER SPRING Sagl, Mendrisio (CH) (hereafter the “Seller”), the following are the Terms and Conditions of Sale of the Seller which, together with any other terms and conditions agreed upon in writing between the Seller and the customer (hereafter the “Purchaser”), shall apply to all sales of goods, services and support by the Seller to the Purchaser. Through the use of the website www.bravo-europe.com, namely in case of placement of purchase orders, the Purchaser declares and agrees to accept and be bound by the present Terms and Conditions of Sale. Orders must be submitted in writing, stating the preferred shipment address, delivery dates, quantities and detailed description of the requested products. Orders may be placed either by post, courier telefax, e-mail or other electronic means of communications (for example through our website) which allow the transmission of orders in written form. Should the confirmation of order differ from the order, the Purchaser shall communicate in writing the discrepancy and its disagreement on the proposed terms within 5 working days from receipt of the confirmation of order. In the absence of any such communication, the Purchaser shall be deemed to have accepted the sale’s terms and conditions as set in the confirmation of order. In case of significant discrepancy between the confirmation of order and the order with reference to material aspects of the transaction (namely: price and quantity of the product), the Seller shall request a written confirmation of acceptance by the Purchaser. In case of non acceptance, the contract shall be considered as never concluded. Except otherwise stated in the written confirmation of order, all prices are exclusive of transportation, insurance costs, value added tax or any other applicable tax, duty, levy or charge in any jurisdiction and the amount of any taxes which the Seller may be required to pay in advance or collect shall be for Purchaser’s account and shall be added to each invoice issued by the Seller as separate items. Any cost, expense, tax, duty, levy or charge referable to the transaction which has not been included in the invoice may be invoiced later on by the Seller. The Purchaser shall pay on the terms stated in the confirmation of order. In principle, the Purchaser is requested to make a full payment through Paypal or credit cards or bank transfer before shipment. Failing any request or indication, payment shall occur net without discount within 30 days from the date of the confirmation of order. The Purchaser shall pay the amounts due in Swiss Francs, without being entitled to set-off. The Seller’s obligations shall be fulfilled at the Seller’s Swiss company premises in Via Raimondo Rossi 24, 6864 Arzo (Switzerland) (hereafter “Place of Delivery”). All transportation or shipping shall be at Purchaser’s costs and expenses. The Seller reserves the right to ship products freight collect and to determine the means of transportation and routing on the Purchaser’s behalf and for his/her account. The Seller may (without being obliged to) insure the full commercial value of the products or declare the same to the transportation company or courier or post at the time of shipment. All freight and insurance costs shall be for the Purchaser’s account, who / which agrees to assume / reimburse them in full. In case of defective products, the Seller shall, at its discretional option, either (i) replace or (ii) repair at its own costs the defective products or (iii) fully refund the amounts paid by the Purchaser. The Seller shall also reimburse the transportation or shipment costs paid by the Purchaser for returning the goods up to a maximum amount of CHF 100.-. Any other remedy or right to compensation is excluded. For the sake of clarity, with the exception of personal injury, the Purchaser shall have no further rights to compensation or any other rights of any kind in case the Seller has fully and timely remedied to the reported defect by exercising one (or more) of the above options. Before returning a product for repair or replacement (as the case may be), the Purchaser shall request a written authorisation by the Seller or by its authorised representatives, which shall contain detailed instructions as to how and where the products must be delivered or shipped. If it is found that the Seller’s products have been returned without cause, Purchaser will be notified of this circumstance and the product shall be returned at its expenses. In addition, a charge of CHF 200.- for testing and examination (any further claim is reserved based on the time effectively devoted to the activity of examination and testing at an agreed hourly fee of CHF 100.- / hour) shall immediately fall due. All contracts shall be construed under and governed by Swiss substantive Law, with the exclusion of the Statute on Private International Law and the United Nations Convention on Contracts for the International Sale of Goods dated as of April 11th, 1980. All disputes between the Seller and Purchaser shall be submitted to the exclusive jurisdiction of the ordinary Courts of Lugano, Switzerland. The Seller shall have the right to bring an action against the Purchaser also before the competent Court of the place where the Purchaser has its domicile / residency or owns assets. Any mandatory rules on jurisdiction as applicable in accordance with international conventions entered into by Switzerland, namely in the field of private consumers’ protection, are fully reserved. The Site claims any and all intellectual property rights regarding the Site, its graphic layout, its databases and the contents produced by it as well as any registered or non-registered trademarks. The user may not alter, copy, publish, reproduce, transmit, divulge, market, create derivative or second-hand works from, visualise or in any way exploit the Services or any content/functionality available on the Site, except for personal use of the Site and of its services, unless prior consent in writing is issued by the owner of the Site. Subject to discretionary revocation at any time, the Site authorises links to the Site’s introductory page (homepage) so long as such links do not harm the Site’s reputation. Conversely, links to the inside pages of the Site (deep links) or the embedding of contents in third-party sites (in-line linking and framing) are prohibited unless prior consent in writing is issued by the owner of the Site. The User bears the risk of accessing, using and navigating on www.bravo-europe.com. The parties choose the Courts of Lugano (Ticino) as the sole venue of competent jurisdiction in the event of controversies arising from or related to the use of the site www.bravo-europe.com. 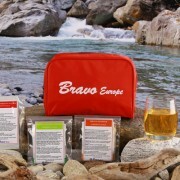 Welcome on www.bravo-europe.com, the information and shopping portal of BRAVO (the “Site”). BRAVO is an innovative product based on the skillful blending of colostrum, bacteria and yeasts freely available on the market, yielding a quality product capable of fostering the user’s well-being. The Site reserves for itself the right to change the Policy at any time and in its own discretion. In particular, the Policy is constantly updated to reflect the evolution of the Federal Act on the Protection of Personal Data (“FAPD”). It is incumbent upon the user, as he enters the Site, to check the status of the Policy. Notice of any changes to the Policy and of their effective date is given either on the Site or by personal (e-mail) communication at least 7 days in advance. Once it takes effect the new Policy will automatically be binding for all users. Accessing the Site after the new Policy has taken effect implies the users’ acceptance of any such changes. Our policy concerning the protection of personal information is described below. We wish you enjoyable surfing on www.bravo-europe.com. The Site does not collect personal data worthy of special protection pursuant to Art. 3.c FADP, such as race, ethnic origin, religion or health status. The Site is authorised to gather and process user-supplied information in order to provide the user with special services such as newsletters and/or to suggest online activities and events – notably of cultural or educational nature – related to the activity of the Site. Within the framework of its activity the Site uses external suppliers of goods and services (Cloud Computing, IT services, hosting e housing services, legal services, etc.). The Site provides such suppliers with access to personal information to the extent such access is useful or necessary for the proper and efficient performance of their tasks. The transmission of and access to such personal information is subject to the proviso that such third parties, as well as the data, are operating or located in Switzerland and have signed a commitment to keep such information confidential and to not use them for reasons unrelated to the performance of their tasks. The Site shall not be liable for the actions of such third parties so long as no serious negligence emerges in terms of the selection, training and supervision of such third parties. The Site is authorised to convey personal information to third parties – affiliates/sponsors/marketing partners/advertisers – for marketing purposes only upon the express and informed consent of the user (“opting in”), in order to make it possible for the user to receive promotional offers, notices of events and customised advertisements from such third parties directly. Conversely, the Site is authorised as of now to provide users, at the personal addresses supplied when registering, with information regarding the activity of the Site and messages of business partners, sponsors and advertisers, even with advertising content. The Site is not liable for the actions of such third parties; this applies particularly to the contents of such communications and to the proper fulfillment of any agreements entered into with the user. The latter has the option at any time to request the end of such communications (“opting out”). Any such request should be made in writing to the e-mail address shown in Section I below. Other personal information, such as e.g. information regarding the use of the Site (IP address, time spent on the Site, services used, activated connections and messages, etc. ), is analysed fully automatically to assess the introduction of new functions, to improve the quality of available services and to optimise the Site’s usability. The Site does not install nor foster the installation of third-party cookies (except for the services of Google Analytics described hereinafter) and (in general) persistent cookies (evercookies) onto the user’s computer. However, the Site’s own cookies are admitted. A cookie is a file on the computer’s harddrive which may be used to recognise the user’s terminal on the web. Cookies can be used to automatically call up personal information entered on the Site previously (such as user name, password, interests, set-up info or preferences) to avoid having to enter it again on subsequent visits. The Site conveys user-related personal information to third parties only if authorised by law, by the Policy or upon the prior consent of the concerned party and provided the addressee has its head office of record/his residence in Switzerland or in a country that protects personal data in a manner consistent with the lists drawn up by the Federal Official in Charge of Data Protection matters, unless such conveyance is requested or authorised by law or is ordered/authorised by a Swiss judicial or administrative authority. The Site is authorised to gather, use and convey personal information relating to users without obtaining their prior consent if such gathering, use and conveyance is permitted or required by law or in the presence of an order issued by a Swiss judicial or administrative authority. Only authorised persons have access to personal user data within the limits of what is strictly necessary for them to perform their tasks. The Site implements all reasonable and proportionate security measures against unauthorised access, use, conveyance, alteration, loss or destruction of personal user data. These measures are of a technical, physical and organisational nature. However, since the internet is an open network, the Site cannot and does not guarantee an absolute level of protection. The parties elect Lugano (TI) as the sole venue of competent jurisdiction in the event of controversy arising from or relating to the use of the website known as www.bravo-europe.com.